Ford Certified. iPod/MP3 Input, Alloy Wheels, Back-Up Camera, Smart Device Integration, Onboard Communications System, CD Player, OVER-THE-TOP RACING STRIPE, TRANSMISSION: 6-SPEED SELECTSHIFT AUT... TRIPLE YELLOW TRI-COAT CLICK ME! Back-Up Camera, iPod/MP3 Input, CD Player, Onboard Communications System, Aluminum Wheels, Smart Device Integration. MP3 Player, Keyless Entry, Steering Wheel Controls, Electronic Stability Control, Bucket Seats. TRANSMISSION: 6-SPEED SELECTSHIFT AUTOMATIC steering wheel paddle shifters, Remote Start System, Leather-Wrapped Shift Knob, TRIPLE YELLOW TRI-COAT, OVER-THE-TOP RACING STRIPE, ENGINE: 3.7L TI-VCT V6 (STD). 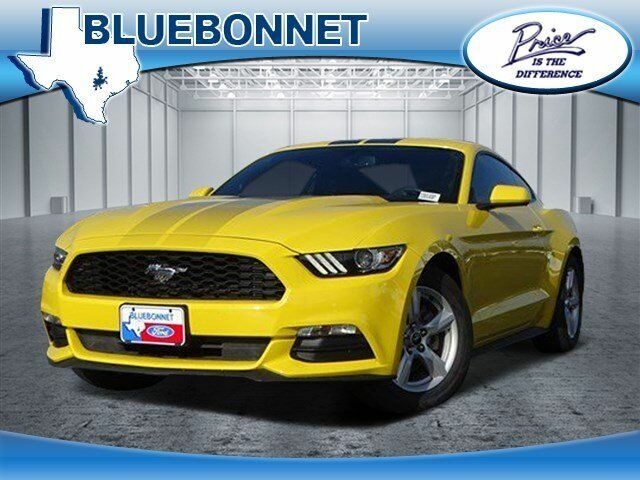 Ford V6 with Triple Yellow Tri-Coat exterior and Ebony interior features a V6 Cylinder Engine with 300 HP at 6500 RPM*. Edmunds.com explains "Regardless of trim level, the Mustang's interior materials are high-quality. Drivers of almost all sizes will easily find a suitable driving position, thanks in part to a standard telescoping steering wheel. ".